Last night, when opening Rolling Stone on iPad Air, Matt Taibbi story “The $9 Billion Witness: Meet JPMorgan Chase’s Worst Nightmare” surprised and delighted. But I wondered: “What the frak?” Nearly 10 months ago, First Look Media brought on the investigative journalist to launch the second of two magazines. I nearly stopped subscribing to RS, because of his departure—instead going from print to tablet digital during my July renewal. Matt and First Look are parted, and “The Inside Story of Matt Taibbi’s Departure from First Look Media” is surprisingly good journalism, particularly coming from First Look’s other online magazine, The Intercept. John Cook, Glenn Greenwald, Laura Poitras, and Jeremy Scahill share the byline. Is that sink-or-swim-together journalism? Depending on upper management’s reaction to a story that’s not the least kind. If the facts are glossed here, I don’t see them, although I detect—and maybe it’s just my rabidly cynical point of view—undertone supporting Matt. When applying the “Who benefits? question, which every journalist should do about everything, The Intercept editors and reporters must deal with the same management structure that couldn’t come to terms with Mr. Taibbi. That’s as much reason to not soften the story as strive to report accurately. Transparency isn’t always what it seems. BTW, if you don’t recognize any of the four bylines on the story, you really should. 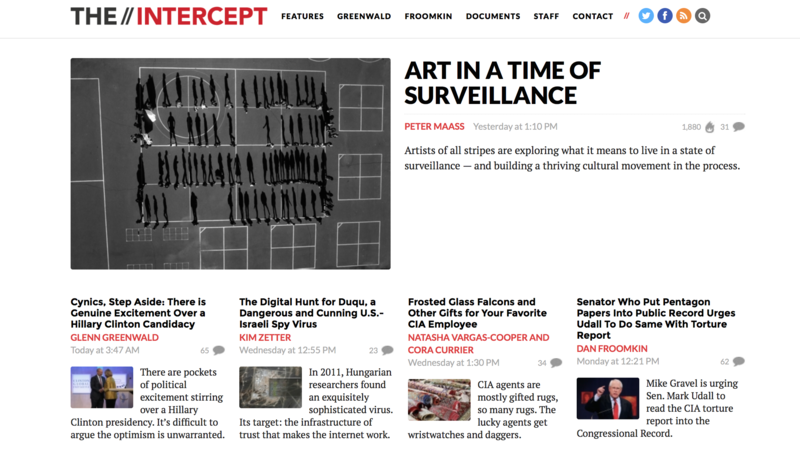 The Intercept has put together, at least by name, some remarkably good journalists. To what end, though, I don’t know. In reviewing a sampling of stories on the front page this morning, none offers any real original reporting. What’s the point then, if news consumers can go to (Heaven forgive me!) Huffington Post for essentially the same aggregated content that costs less to produce because the writers aren’t big-name kahunas. Many of the journalists tapped for these new ventures come from the pool of senior staff members laid off from mainstream publications following the September 2008 stock market crash. They were victims of advertising and search engine obsessions before, and the newsonomics are no better—by most measures worse—a half-decade later. Huffington Post, like other aggregators, feeds off the Google free economy by feeding it aggregated content. My last two posts—”I am NOT an Old School Journalist” and “What is Clickbait?“—will set you straight why the reciprocal relationship strips value from original content, including news. I can’t help wonder if the journalists hired by First Look for their brilliance and name appeal are just smart enough to flee the ship before it enters stormy waters. Matt Taibbi isn’t the only exit of note. Posted yesterday morning: “John Cook is Leaving The Intercept to Return to Gawker at the End of the Year“. He is editor-in-chief, which makes me wonder about what the departure means. Gawker is an intriguing amalgamation of new and old media journalism. The publisher’s blogs feed off the fringes of aggregation, while producing lots of original and interesting content. The headlines are tabloid, but the content typically is not clickbait. What’s interesting to me are the editorial similarities between Gawker sites and The Intercept, which presumably is Cook’s doing. The clean, uncluttered layout pleases the eyes and emphasizes content. Priority goes to text—the story—over art, while minimizing elements that might distract from the headlines. The layout isn’t far removed from other magazine-style web designs, except for the generous white space that allows the eyes to easily find stories in the various quadrants. To be clear: Magazine-style refers to a common webpage design, not traditional print layout that The Intercept is nothing like. Presentation-style, while arguably different, is reminiscent of Gawker, which is busier and flows down the fold. The Intercept uses more defined quadrants to separate stories. The Intercept story style is pointed, personal, and provocative—and in my cursory reading is more advocacy journalism, with respect to political reporting. Advocacy journalism presents a point of view, rather than the objective voice, often with a specific readership in mind. This style is quite common among traditional political print pubs, like The American Spectator, where my wife once worked as a graphic designer. I will spend more time reading The Intercept, if for no other reason than updating my book, which dedicates some space to First Look Media. But in looking over the site today, I like the brash style but, again, wonder what place there is for it in the aggregation universe where we live. Perhaps you wonder who produces the kind of journalism (mainly long-form or immersive) I consume, and would prefer The Intercept and similar ventures to be like: Mother Jones, ProPublica, Rolling Stone, Vanity Fair, and Vice News. As for Matt Taibbi, his return to RS is welcomed by at least one reader. If you wonder what The Intercept wrote about his departure, read the story linked in my first paragraph. I am not an aggregator, and any recap wouldn’t adequately capture the content and tone of the four-byline story.